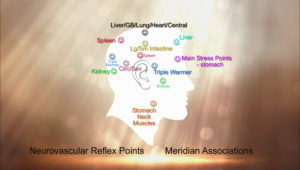 These are non invasive techniques that affect the blood flow..both to organ systems in the body, and to parts of our brain that govern our stress and fear responses. These are called neurovascular reflex techniques. By holding certain points on our heads, we can retrain our stress response loops not to react in fight or flight mode to seemingly small stresses. The world we live in is filled not only with emotional stresses of coping with the pace of life and the expectations we and others hold for ourselves, but also with unnatural energies that our bodies were never programmed to deal with.... think of all the electromagnetic energies and radiation emitted from all of our modern conveniences.. often the small daily stresses that elicit admittedly and unwittingly harsh reactions are simply overload reactions when our systems have been bombarded with cell phones and computers all day. We can effectively calm this tendency toward over reactive responses, anxiety, and fear simply by holding a negative thought and the corresponding neurovascular reflexes simultaneously. Here's a short video tutorial to help lift you out of stress in the moment. We can also use this technique to clear old stresses that continue to elicit an emotional response locked within the energy of traumatic memories. Bringing those old stresses to mind and holding these points will effectively start to clear the emotional hold of difficult memories. Systematically clearing old emotional debris also helps to reprogram your energies such that your body doesn't go into crisis mode for every challenge that comes your way!